Dr. Bill Donahue (Ph.D., University of North Texas) is Executive Director of Small Group Ministries for the Willow Creek Association (WCA) and works with Willow Creek Community Church to train and develop small group leaders. The church has over 2,500 small groups and the WCA has over 12,000 member churches worldwide representing over 95 denominations in 27 countries. He is the author of Leading Life-Changing Small Groups and coauthor of Building a Church of Small Groups, The 7 Deadly Sins of Small Group Ministry and Walking the Small Group Tightrope (all with Russ Robinson). With Greg Bowman he is the author of Coaching Life-Changing Leaders. 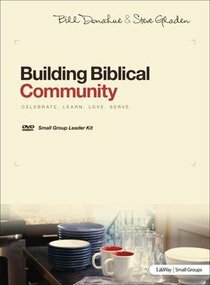 He has also written In the Company of Jesus and the Jesus 101 small group study series (with Keri Wyatt Kent).